2013 resolution ceremony declaring the Month of May “Water Safety and Drowning Prevention Month” in Brevard County Florida! Thank you Rotarians for your help! Josh the Otter in Medford, MA! On June 2nd Josh and the club will be at the Williamstown Music Festival on Main street. At 5PM the children will be able to meet Josh, view his video, sing the song and receive a coloring book and sticker. Also all Monroe Township kindergarten classes will get a visit from “Josh the Otter”. They will hear the story, sing the song and receive a coloring book and sticker. This project has been met with overwhelming enthusiasm by school superintendent Charles Earling, all the principals of the schools and the kindergarten teachers.The presentation will be June 11th and 12th just in time for summer break and the swimming season.The classes will be incorporating water safety into their curriculum prior to our visit. This looks to become another of The Rotary Club of Williamstown’s annual projects. From the coast of eastern Florida to the shores of Hawaii, the message of Josh the Otter is spreading…quickly! Rotarians across the country and even the world are hearing the life saving message and are excited at the positive changes that a partnership between Josh the Otter and Rotary International can bring to communities everywhere. Over the past two years, Rotarians have distributed thousands of “Josh the Baby Otter” books and everyday more clubs are starting their own Josh the Otter literacy and water safety projects. With drowning a leading cause of unintentional death for children all over the world, Rotarians are helping to save thousands of lives! Rotary International and Josh the Otter’s partnership started in Florida in 2010 with the vision of one incoming Merritt Island club president, Jim Underwood. 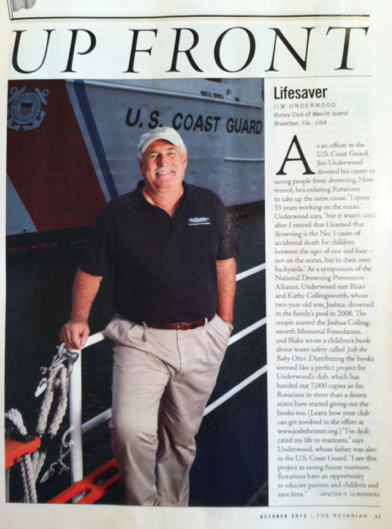 As a newly retired Rear Admiral in the US Coast Guard, Jim saw the potential to save children’s lives with the help of Rotarians pursuing this project in their local communities. In Florida, drowning is the #1 cause of unintentional death for young children. Through the leadership and support of Jim, PDG Louis Venuti, and Richard Hattwick, General Coordinator for the RI Literacy Resource Group, thousands of children in Florida are meeting Josh the Otter and learning how to be safe around water. The Josh the Otter project has been a District-Wide Literacy Project for 6930 for the past two years and their efforts do not stop at the district level. They wanted Josh everywhere there is Rotary. Due to the overwhelming support of the District 6930 clubs, Josh the Otter was awarded a project booths at the Rotary International Convention House of Friendship in New Orleans this past May. With an attendance of 22,000 Rotarians from around the world, Josh the Otter supporters were anxious to see the response from the booth. Excitedly the Josh the Otter booth remained swamped the entire week of the conference, 10 hours a day! With visitors ranging from Boston to Bangladesh and United Kingdom to the Ukraine, it was absolutely thrilling to hear their support of our project and their interest in partnering to provide the project to their communities. By the end of the conference, over 200 Rotarians wanted follow up information concerning how they could begin their own Josh the Otter projects. Since the convention, over 20 U.S. states and Pakistan have Rotarians pursuing the Josh the Otter project within their own clubs. In District 7640 in New Jersey, DG Alan Stein has already approved the project to be a District-Wide Literacy Project and many clubs have already signed on within the district. In Washington State, current president John Hughes and his members of the Woodinville Rotary Club have purchased 1000 copies of the books and are working with local school districts and YMCAs to spread the message of water safety with Josh the Otter. From District 5000 in Hawaii with Gale Warshawsky to the Rotary Club of Rawalpindi, Pakistan with Munir Ahmed, Josh the Otter is saving lives through the power of Rotary International. To learn more about starting your own Josh the Otter Water Safety and Literacy Project please visit www.joshtheotter.org. There is a specific Resource Section for Rotarians. The Joshua Collingsworth Memorial Foundation, which created Josh the Otter, was founded in honor of 2-year-old Joshua Collingsworth who died of a drowning incident in 2008. The foundation, started by his parents, Blake and Kathy Collingsworth wanted to honor Joshua’s name by saving countless lives through a fun and simple drowning prevention educational program. Water is safe but only when we are all together! Drowning Prevention – The Ultimate Goal Of Local Rotary Club Program Posted October 28, 2010 at 12:30 p.m. The program started with the book “Josh the Baby Otter” written by Blake Collingsworth to promote water safety for children. Drowning is the #1 cause of death for children from the ages of 1-4..This program has been approved by the Martin County Board of Education and is available for presentation to other schools, libraries, day cares and other organizations Call Christine Moreno-(772) 288-1020 or Peggy Merritt-772-530-8568 to schedule.For more information about the program go to http://www.joshtheotter.com. Chamber member Christina Gillen-Theiss from “Swim with Gills” spoke to the parents at Dunbar and will be at Hobe Sound Child Care to speak to the parents there. She has swim classes and private demonstrations for those interested The YMCA has swim classes for infants and young children and the Red Cross has CRP classes for infant and young children. Both organizations have offered to help for those interested. Donations for the purchase of the coloring books has been received from Jupiter Is Pools, Davy Jones Pools, Flamingo Pools, Attorneys Paul McMahon and Gloretta Hall ,Jan and Richard Otten and Lillian Johnson from the Hobe Sound Chamber of Commerce. Heritage Ridge Golf Club on Friday mornings at 7:15AM. Visiting Rotarians and those interested in Rotary are welcome. Call Doc Buchanan at (772) 621-6621. From the coast of eastern Florida to the shores of Hawaii, the message of Josh the Otter is spreading. Rotarians across the country and even the world are hearing the life saving message and are excited at the positive changes that a partnership between Josh the Otter and Rotary International can bring to communities everywhere. Rotarians have distributed thousands of “Josh the Baby Otter” books and everyday more clubs are starting their own Josh the Otter literacy and water safety projects. 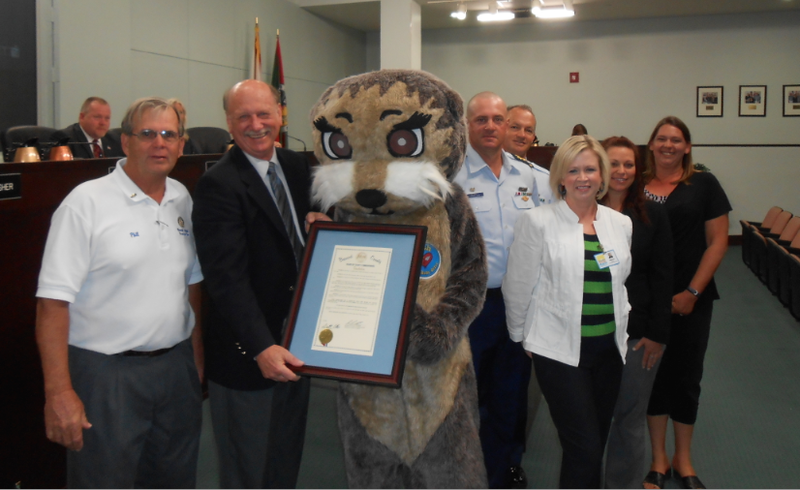 With the help of our newly inducted Board of Directors member, U.S. Coast Guard Rear Admiral (retired) Jim Underwood, thousands of children in Florida are meeting Josh the Otter and learning how to be safe around water. Jim is the past President of the Merritt Island Breakfast Rotary Club and through his leadership, the club gained approval to distribute the book to all Brevard County District school children in early 2010. Since Merritt Island’s success, many other neighboring Rotary clubs, including the Cocoa, Indiatlantic, Hobe Sound-Port Salerno and Vero Beach clubs, are bringing Josh the Otter to their schools! To our excitement, Richard Hattwick, the General Coordinator for the Rotary International Literacy Resource Group, and Louis Venuti, Rotary International Governor of District 6930 have fully embraced the Josh the Baby Otter literacy and water safety project. They are anxious to get the book into the hands of as many children as possible. The message has spread all the way to Hawaii, where Rotarian Gale Warshawsky, District 5000 Basic Education and Literacy Chair, is excited to bring Josh the Otter to her district’s schools in the near future. With amazing Rotarian partners joining in our mission, Josh the Otter’s Water Safety and Awareness Project has the potential to reach its message to children and adults worldwide! The Joshua Collingsworth Memorial Foundation team headed to New Orleans this to promote “Josh the Otter Water Safety & Awareness Project” to over 22,000 Rotarians from around the world. Completely exhausted from the preparation for our annual benefit dinner & auction, we were anxious to see what a week in New Orleans would reveal about Rotarians’ interest in our literacy & water safety project. We set up a booth in the Friendship House, pictured above. With over 300 booths in the convention room, we weren’t sure how many visitors would stop by. Little did we know we would be swamped nearly all of the 10 hours the Friendship House was open each day. We took shifts to keep us sane & relatively fed, but we were enthused to see how much interest was generated from Josh the Otter. Our Florida District 6930 sponsored our booth & they were a wonderful testament to show how many clubs are already involved in their own Josh the Otter Water Safety & Literacy Projects each year. With visitors ranging from Boston to Bangladesh and United Kingdom to the Ukraine, we were absolutely thrilled to hear their support of our project & their interest in partnering to provide the project to their communities. While the booth kept us busy, we were able to enjoy the gourmet food & live entertainment New Orleans has to offer. Furthermore, we were able to hear Bill Gates speak on the last 1% of eradicating polio from the world. It was absolutely motivational to see a long term project that started from one man’s idea…come to near completion. Of course we related it to our journey. We are here to stay & ready to invest the time it will take to see a world where drowning is not a leading cause of death around the world. With over 200 follow up requests, we will be kept very busy as we continue to grow these partnerships & see how many new place across the country & around the world will have their own Josh the Otter projects! Click to view: District 6930 Newsletter-Sept 2011 Thank you for District 6930 for highlighting the Josh the Otter Water Safety and Literacy Project! Josh The Otter was born from the urgent need to protect children through an outstanding water safety program combined with emerging literacy for young children and ESL students. Presented in a learning kit that features a CD, the story of Josh, a coloring book and stickers, has touched and potentially saved the lives of thousands of children around the world; not just here in the US. Governor Alan Stein attended the Rotary International Convention in New Orleans this year. Immediately he recognized that there was a match between Rotary Clubs everywhere. He brought the opportunity for Community Service to 7640. Everyone that I know who has had a “Josh experience” agrees of that potential to empower kids with safety AND has an incredible corporate fundraising opportunity to reach as many young lives as possible in schools, libraries, homeless shelters etc. through GSR donations and presentations. I have already spoken to local businesspersons about purchasing “blocks of books” for distribution into the community. Other community and school based leaders see one more example of how GSR gives Service Above Self. Individual kits will also be available for family and friend gifting. I know that JOSH likes to hang out (see above) and spread the message ~ STAY SAFE and support JOSH. There’s a rumor that JOSH will be swimming up the Delaware and come ashore on October 6, at Café Madison. BE THERE. 1) World Aquatic Health Conference- Oct 11-14th in Seattle, WA was a wonderful opportunity. As first time attendees, we were not sure what to expect but we were pleasantly surprised at the caliber of attendees at the conference. Our booth was once again very busy with individuals working in all aspects of the aquatic profession (game and parks, city departments, CDC, state health departments, pool owners, aquatics directors, etc). The National Swimming Pool Foundation put on the conference and we were able to visit with quite a few members of the foundation. The NSPF gave us $1,000.00 last April after we met with the ED in Colorado Springs, CO. While in Seattle, we were able to get a private tour of the Bill and Melinda Gates Foundation Headquarters by Blake’s sister Connie who works there as the lead lawyer. Furthermore, we met with the Woodinville Rotary Club members that are endorsing the Josh the Otter Project and committed to buying 1,000 books for their first year effort! 2) Rotary International Zone 33-34 Institute-Oct 20-23 in Washington, D.C. Kathy, Ashley and Laura attended this conference to further our most valuable resource thus far…Rotary Clubs! The attendees of this conference will be the past, president and future District Governors from both zones. This region covers many eastern states and even the Caribbean! To help you understand the impact of one District Governor’s endorsement of the project, each DG oversees 50 Rotary Clubs. In short–we may be growing even larger after this conference. We have had a wonderful showing of support at the conference and look forward to adding a few more states to the Josh the Otter Water Safety and Awareness Project! Viva La Rotary!! To date, we have over 16 states and two district-wide Josh the Otter Projects that are involved in our project. 3) Midwest Regional Pediatric Conference-Oct 26-28 in Sioux City, NE. Dr. Truemper has been instrumental in getting our foundation involved with this conference. We are a sponsor for the conference and we have brought in an amazing key note speaker, Dr. Frank Pia, who is very involved with drowning prevention efforts. As our partnership with Children’s Hospital Omaha grows, we are hopeful we will be able to engage regional hospitals to take a closer look at drowning prevention education and our project. INDIAN RIVER COUNTY, FL – Over the last two months, a special visitor has made the rounds to Indian River County elementary schools. The furry creature came to teach children the importance of staying safe around swimming pools, reminding them to never go near one without an adult. “They all think they can swim,” Rotary Club of Vero Beach Oceanside member Susan Smith said of kindergarteners. The Rotary Club partnered up with five others in the Indian River County to bring Josh Otter and his friends to area schools. Smith said that the Rotary got involved after hearing the statistics of childhood drowning in Florida. Last year, Florida was in the Top 10 for the number of drowning incidents of children under 14. The Josh the Baby Otter water safety program was named for a child, Joshua Collingsworth, who died of complications due to drowning. He was 2 ½ years old. His parents thought he had slipped near the side of the pool when he went in. Part of the program focuses on teaching young children to never go near a pool without an adult. Another part teaches them to roll onto their back to float if they accidentally go into a pool. Due to the expense of the program and trying to reach 1,400 children, the Rotary Clubs in Indian River County opted for the pool safety portion of the program rather than the float portion. As for the float portion, the Rotary Clubs are working to raise funds for scholarships that can be awarded to children for swim classes. “It’s so expensive to run,” Smith said of the flip and float program. As it was, the Rotary Clubs expected to pay $6,000 to put on the limited Josh the Otter program – covering the cost of renting the mascot and purchasing enough books and coloring books for the kids. They lucked out this year, according to Smith, because they were able to borrow the costume at no charge. Next year could be different. Smith said the clubs would be working with companies in the county, seeking sponsorships to help underwrite the cost of the program so the clubs themselves won’t have to dip so deeply into their coffers. The Rotary Clubs are working with the Indian River County Recreation Department, which is offering “Josh the Otter Days” on April 9 and May 21. On those days, children can meet Josh the Otter and parents can learn about various swim classes the department offers at the Gifford and North County aquatic centers. For more information about Josh the Otter, visit www.JoshTheOtter.org. To donate or otherwise support the Rotary Clubs’ mission to promote water safety, contact Rotary Club of Vero Beach Oceanside President Maureen Labadie at (772) 589-3025. Josh the Otter, the spokes…uh, animal…for the Hobe Sound-Port Salerno Rotary Club’s water safety program, hitched a ride for the 25th annual Hobe Sound Christmas parade. He was accompanied by Rotarians and the RotaKids of local elementary schools, who made sure that their friends and schoolmates got lots of treats thrown to them as they marched along Josh. Rotarian Blake Collingsworth developed the program to teach young children how to float after losing his own 2 year-old-son to drowning, the number-one cause of death of children under five. The program has been approved by the Martin County Board of Education and is available for presentation to other schools, libraries, day care centers and other organizations. To schedule a presentation, call Christine Moreno at 772.288.1020. For more information about the program go to www.joshtheotter. The Voorhees Breakfast Rotary is a vibrant and active service club that helps make up part of the 54-club membership of Rotary District 7640, which covers the southern area of New Jersey. The VBRC has donated thousands of dollars in scholarship money to local high school students and hundreds of food baskets and back packs with school supplies to needy Voorhees families. They have given books to the Virtua Hospital Pediatric Unit and more than 500 videotapes to local senior facilities. Internationally, the club has raised funds for victims of the tsunami, Hurricane Katrina and the earthquake in Haiti. The club is a fixture at Voorhees community events and sponsors our local Easter egg hunt every year. The VBRC has undertaken a new project that emphasizes the importance of water safety and awareness. Although the season for swimming is coming to an end, there is never an offseason for drowning tragedy, the second leading cause of accidental death for children five years old and younger in New Jersey. Such accidents can happen in only an inch of water and in less than five minutes. Statistics show that 70% of preschoolers who drown are in the care of one or both of their parents at the time of the tragedy. With the recent wet weather that caused record flooding throughout our state, water safety is important for children and adults to understand. Swimming skills can be taught to children at the age of 3 months and can save their lives in the event of a water emergency. Skills include learning to float and to kick to the surface. Preparation and education are the keys to avoiding drowning tragedies. The members of the VBRC are on a mission through their newly adopted “Josh the Otter” project. The “Josh the Otter” project will be the vehicle that emphasizes the importance of water safety and awareness in our community. The mission is to stress the importance of physical skill building in the water, starting in infant years, and to promote the “Otter Curriculum” which will be donated by the club to schools, daycare facilities and libraries throughout our area. The curriculum includes a children’s reading book, coloring book and stickers that are fun and educational tools that teach children and parents about water safety. The core of the curriculum is the children’s reading book that tells the story of Josh the Baby Otter, who learns how to float with his friends in the water, but only when a parent Otter is present. The books are a fun, yet essential tool for families to use when explaining the importance of water safety. “Otter Sightings” will be planned throughout the school year for Josh to read to students and teach them the “Learn to Float” song. The Otter will also stop at the local infant/toddler swimming programs to inform parents where they can bring their children for professional swim instruction. Donations will help the VBRC purchase more Otter Curriculum materials to distribute to children’s facilities throughout Camden County and South Jersey. To follow the ongoing progress of the VBRC Josh the Otter Campaign and to see where the next Otter Sighting will be, “Like” The Voorhees Breakfast Rotary Club’s Josh the Otter Facebook page. For questions and more information on the VBRC efforts to put an end to accidental drowning, contact Chairperson Christina Pinizzotto at cpinizzo@gmail.com. **The third annual benefit for the Chad Gunther Memorial Fund will be held on Sept. 17 at the E-Lounge, 807 Rt. 70 West, Cherry Hill. The fund was created in 2009 as a living memorial to a young man who loved children, sports and helping others. Though his life was cut short, the fund honors Chad’s memory by helping needy children to participate in various activities and sports. Tickets are $50 per person and include dinner, beverages and entertainment by comedian Paul Venier. Tickets can be purchased by contacting Bob Shulman at 856-782-1666 or at bobshulman@mac.com. Donations can be sent to the Chad Gunther Memorial Fund, P.O. Box 404, Voorhees, N.J. 08043. **The 2011 Summer Twilight Series concludes with the Township’s Annual Movie Night in the Park on Sept. 24 (rain date Saturday, Oct. 1). The students in the Voorhees Schools will vote on their favorite movie to be shown on the “big screen.” The event is free and begins at 7:30 p.m. at Connolly Park. DG 7640 Alan Stein is Promoting Josh the Otter District Wide! Rotary Club of Anthem, AZ! Sometimes significant events happen in our lives that bring us to our knees and render us helpless. Isn’t it times like those that seem to present the greatest opportunity to make a difference in the lives of others? The day this happened to the Collingsworth family changed their lives forever. Little Joshua was found floating in the pool, and after spending three days on life support at Children’s Hospital in Omaha, his parents made the agonizing decision to remove the machines that were keeping him alive. He passed away 45 minutes later. The Collingsworths were devastated by the loss of their only child. This could have easily ruined any parent. The last thing that a parent expects to do is bury his or her own child, especially at such a tender age. The Collingsworths knew that Joshua would have been a great young man if given the opportunity, so they decided to make his legacy great, by giving other children the opportunity to live long, productive lives. They started by giving other children the gift of life through organ donation as soon as Joshua passed away. Soon after, they became committed to making sure no more children succumb to drowning, and toward that end, they created the Joshua Collingsworth Memorial Foundation. Blake Collingsworth wrote a book to reach their target demographic, two- to five-year-olds. The book tells the story of Josh the Otter, who learns to float under adult supervision, and then learns to swim. It is a fun and educational book that emphasizes to children the importance of learning to float first like Josh the Baby Otter and never going near the water without an adult. Within the past few years the book has grown in popularity and is being widely supported by many Rotary clubs, schools, community clubs, individual donors and businesses. Residents Tom and Bonnie Markham were attending an international Rotary convention last May when they first discovered this worthwhile project. It was the engaging of the parents, caregivers and teachers by the children that attracted the Markhams to this project. “It’s not just the usual list of dos and don’ts on water safety handed out to parents,” Bonnie said. “Kids are encouraged to engage their caregivers and anybody who will read to them the story so they will never forget to be safe like Josh the Baby Otter. During the Markhams’ visits to local preschools, impressionable youngsters are read the story, meet the Josh the Otter puppet, take the pledge declaring they will not go near water without an adult and, in that way, will be safe like Josh the Baby Otter. They then receive a copy of the “Josh the Otter” book, as well as a CD that includes the Josh the Otter story and the Josh the Otter water safety song. The children also receive a Josh the Otter coloring book and a Josh the Otter sticker, worn proudly to show and engage parents and caregivers. The Anthem Rotary Club has funded the Markhams to present the Josh the Otter program to a number of preschools in Anthem. To date, almost 600 preschoolers have attended the Markhams’ presentation. Anthem Rotary will be taking the program to the Rotary District Conference in Prescott with the hope of getting other Rotary clubs involved so more schools in Arizona can experience this life-saving project. If you’re interested in bringing this program to your child’s school, please contact Bonnie Markham from Rotary Club of Anthem. If you want to be proactive about teaching your little one to swim, lessons are a fantastic opportunity for children as young as 6 months old to start learning water safety skills. Aqua-Tots Swim Schools recommend that all children be enrolled in some type of swimming lesson program as early as possible. Of course, lessons can never take the place of constant supervision, but they are a great start! Aqua-Tots offers fast-track classes that run for two weeks from May 21 to July 19. Swimming classes are available in Anthem from June 4 through Aug. 30 at Bela Rosa apartments pool, and are held at Ironhorse apartments in Tramonto from June 5 through June 28. In-home, private, semi-private or group swimming lessons are also available. Rotary Club of Northlake-Mandeville, LA Article!